Waterjet Tech, conveniently located in the St. Louis area, specializes in CNC robotic waterjet cutting services. With state-of-the art robotic waterjet cutting equipment and CAD/CAM technology, our shop provides quick turnaround as well as precise, economical water jet cutting of virtually any material or part. We also have a laser cutter for all your laser cutting, engraving and etching needs. And because we follow ISO 9001:2008 Standards, customers can rest assured that their cutting projects are in good hands. Waterjet cutting, a process where a jet stream of water is forced through a tiny nozzle at a very high pressure, provides many unique capabilities and advantages that allow the cutting of materials and parts often considered too costly or even impossible with other methods. 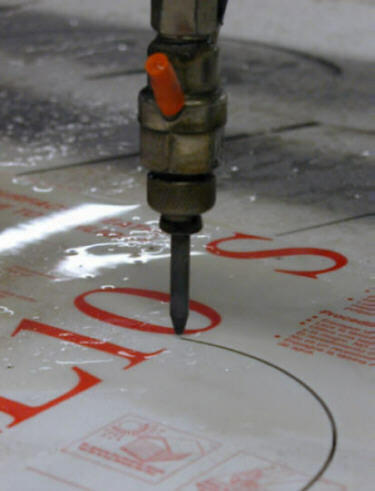 Our 3-axis abrasive waterjet cutters are able to cut through the hardest of materials including stone and metals, leaving smooth, extremely accurate edges. Water jet cutting is an environmentally friendly technology as well. Waterjet and abrasive jet cutting performs precision cutting, beveling, piercing, etching, and slotting up to accuracies of ±.005. Through the use of CAD/CAM technology, identical parts can be produced and changes made quickly and easily. Eliminates material distortion or degradation such as burning, crushing, chipping, and fracturing that occur with other cutting methods such as laser or die cutting. Minimal waste achieved by using narrow kerfs along with computerized part nesting. Waterjet cutting reduces the need for tooling and post-machining work as part edges are beautifully smooth and finished.